Characteristics of 16th Century Mannerism, La Maniera. The first reaction against the leading exponents of High Renaissance painting - Leonardo, Michelangelo, Raphael, and Andrea del Sarto - occurred in Florence between 1515 and 1524, when the painters Rosso Fiorentino (1494-1540) and Jacopo Pontormo (1494-1556) broke away from the naturalism and harmony of the High Renaissance idiom. Treated sympathetically by some 20th-century art historians, including Max Dvorak in his book Uber Greco und der Manierismus (1921), these early 16th century nonconformist painters came to be known as Mannerists. Recent scholarly opinion, however, has applied the term Mannerism to describe a very different style of cinquecento painting, which first appeared in Rome about 1520. This Rome-born Mannerism, which in due course spread throughout Europe, was not a revolutionary new development, but rather a transformation of Renaissance art allied to a change in the mentality of the times. On the surface, it was characterized by a certain artificiality, a deliberate and pronounced cultivation of stylishness, and a sophisticated delight in the bizarre. The Council of Trent (1545-63) launched its campaign of Catholic Counter-Reformation art just as Mannerism was taking hold in Italy. Vatican authorities cracked down on Mannerist-style Christian art that was unintelligible to most churchgoers, such as (one suspects) Parmigianino's Madonna of the Long Neck. The actual word Mannerism is derived from the Italian word "maniera" (literally meaning "style"), and was first used in 16th century art criticism to describe a definable quality - that of stylishness. The painter and art historian Giorgio Vasari (1511-1574) - known for his biographical treatise Lives of The Artists (1550) - identified the source of this stylishness as being the works of Leonardo da Vinci (1452-1519), Raphael (1483-1520) and Michelangelo Buonarroti (1475-1564). If the Mannerist tendencies of Leonardo's works are perhaps overstated, Raphael's Transfiguration (1520, Pinacoteca Apostolica, Vatican, Rome) undoubtedly reveals clear signs of the sort of expressionism that was to become associated with Mannerism. In fact, some art experts think that the dramatic tension and exaggerated forms within the work foreshadowed Baroque painting, never mind Mannerism. Michelangelo's Last Judgment fresco (1534-41) on the altar wall of the Sistine Chapel was another example of High Renaissance art with Mannerist tendencies. But while Leonardo, Raphael and Michelangelo may have been the source, according to Vasari it was their followers who - having had the opportunity of fully digesting the discoveries of Early Renaissance painting and High Renaissance aesthetics - had refined the models created by these great masters. These later followers, Vasari thought, understood the secret of true artistic style - the maniera. One should note, in passing, that Mannerism manifested itself mainly in painting, since sculpture continued pretty much unhampered by any constraint, and there was virtually no Mannerist architecture. To begin with, there was nothing negative about the word 'Mannerism'. It described a sort of stylistic elegance, and reflected a general fascination with this elegance as well as the particular style or maniera of such and such an artist. In due course it designated the 'grand manner' which became the fashionable style in Rome around 1520. (2) In their desire for creative freedom, Mannerist artists revamped the classical High Renaissance canons of proportions. The ideal height of the human figure was amended from seven and a half times the height of the head, to nine and a half times. In addition to this stylistic elongation of the human body - which was sometimes applied to individual features, see for instance Parmigianino's Madonna of the Long Neck (1534-40, Uffizi Gallery) - Mannerist paintings also featured new forms of background perspective, in which the pictorial space was completely filled by foreground figures: see, for instance, The Deposition (1526, Santa Felicita, Florence) by Jacopo Pontormo. The use of light from a single source was sometimes abandoned in favour of contrasting effects of light and dark; lurid lighting was also introduced, as was the use of unnatural colours. (3) As well as creating artificial images of nature, some exponents of the maniera resorted to a style called disegno fantastico, which consisted of whims, inventions, eccentricities, and other oddities: an artistic category exemplified by the court portraits of Arcimboldo made up of fruits and vegetables. (4) Because of all this, Mannerism was designed to appeal to the connoisseur - the knowledgable art lover, who could appreciate its complexity and virtuosity. However, Catholic Counter-Reformation patrons found the new style quite unsatisfactory - at least when applied to religious art, such as the altarpiece - because its very stylishness tended to overshadow its biblical message. Even Michelangelo's Last Judgment fresco was bitterly criticized by some observers, for its (mainly) male nudes, while he himself was referred to as "the inventor of obscenities, who cultivated art at the expense of devotion." This general feeling of dissatisfaction - or at least scepticism - on the part of the Catholic Church, Europe's leading patron of fine art, caused Mannerism to fall into general disrepute and when, in 1662, the French architect Freart de Chambray invented the word 'Manieriste' (later translated as "Mannerist" by the English writer John Evelyn), he used it to disparage Vasari and his contemporaries, the essential practitioners of the maniera. See also: Classicism and Naturalism in Italian 17th Century Painting. Note: An early expert in the attribution of paintings created during the Mannerist era, was the Renaissance scholar Bernard Berenson (1865-1959), who lived most of his life near Florence, and published a number of highly influential books on Italian art of the period. During the period c.1510-20, Andrea del Sarto (1486-1530) was the leading practitioner of High Renaissance naturalism in Florence. The emotional tension present beneath the harmony of Andrea's colours and forms was seized upon and accentuated by one of his most precocious pupils, Jacopo Pontormo, who had been praised as a youth by Michelangelo himself. In Pontormo's celebrated Visdomini Altarpiece (1518), the emotional tension almost reaches breaking point; the composition is vertical and has no sense of space, while a host of similar but discordant centres of action create a tangible feeling of agitation. 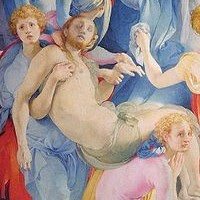 Pontormo persisted with this expressionism, becoming more and more influenced by the angular forms of Albrecht Durer's prints and by some of the more tortured aspects of Michelangelo's figures. Another of Andrea's talented pupils, the sophisticated but unpredictable Rosso Fiorentino, reacted in a similar spirit of expressiveness. Aside from its two cherubs, his unconventional Virgin and Child Enthroned with Four Saints (John the Baptist, Anthony Abbot, Jerome and Stephen) (1518, Uffizi) created for Santa Maria Nuova, turns its back completely on High Renaissance naturalism, and is more iconoclastic than anything by Pontormo. Three years later, he produced the equally extraordinary Deposition (1521, Pinacoteca Communale, Volterra) for Volterra Cathedral. Its disjointed composition, distended and out-of-proportion figures, and unnaturally cool colours make it an excellent example of early Florentine Mannerism. In 1523, in search of commissions from the new Pope Clement VII, Rosso Fiorentino travelled to Rome where he was blown away by three experiences: Michelangelo's Sistine Chapel frescoes, the late (Transfiguration) style of Raphael, and the art of the recently arrived Girolamo Francesco Maria Mazzola, better known as Parmigianino. Born and trained in Parma, Parmigianino brought three sample pictures with him to Rome, as evidence of his artistic skills. His style, influenced by that of Correggio, already had much of the attenuated elegance for which he became famous. Rome loved him and he was hailed as the new Raphael capable of reproducing the subtle grace of the latter's late works like St. Michael (Louvre). Although Raphael had died in 1520, his decorative frescoes in the Vatican stanze (Raphael Rooms) was continued by his most important pupils, Giulio Romano (1499-1546) and Perino del Vaga (1501-47). Their style of painting relied upon a refined use of classical antique forms and an intricate exploitation of different levels of pictorial reality. Rosso Fiorentino's encounter with Michelangelo's Genesis fresco and Parmigianino's work led to a radical and more sophisticated change of style. His Dead Christ with Angels (1526, Museum of Fine Arts, Boston), a picture which he might previously have executed with exceptional angularity of form, is quieter, endowed with more subtle emotion and a surprising sense of beauty. Raphael's pupils and the new arrivals Rosso and Parmigianino undoubtedly influenced one another during the mid 1520s, but alas in 1527 Rome was pillaged by marauding troops of the Emperor Charles V, who compelled the Pope to abandon the Vatican and flee to Orvieto. Parmigianino escaped to Bologna, returning four years later to his native city of Parma, where he continued to develop his personal maniera (Madonna of the Long Neck). Perino del Vaga entered the service of the ruling family in Genoa, while Rosso Fiorentino spent several years restlessly wandering between Arezzo, Citta di Castello, San Sepolcro and Perugia, before being summoned to the French court and put in charge of the interior decoration at the Chateau de Fontainebleau. [Note: for more details of this mini-Renaissance of French art, see: Fontainebleau School (1528-1610).] It was here that he created his masterpiece the Gallery of Francis I, with fresco paintings and ornamental plasterwork. The sophisticated style of Mannerist art that evolved in Rome before 1527 at the hands of Parmigianino and his colleagues was the main influence on the individual styles of several important younger artists. Vasari and Francesco Salviati (1510-63), both of whom had been apprentices in Andrea del Sarto's Florence, parted in 1527 but resumed contact in Rome (1531), where they tried to combine the formal and narrative system of Raphael's late frescoes with the figurative style of Michelangelo. In Vasari's case, the result was somewhat disjointed, but Salviati succeeded in producing an individual maniera of enormous inventiveness - see, for instance, his mural painting Peace (1544-48, Palazzo Vecchio, Florence). While Salviati's career was peripatetic - he painted in Rome, Florence, Venice, and France - Vasari returned to the Florentine court of Cosimo I de Medici, who succeeded the murdered Alessandro de' Medici in 1537. Cosimo in concert with his Spanish wife, Eleonora de Toledo embarked on a shrewd series of projects to strengthen his political position, for which Vasari became Stage manager. His artistic success as a painter and architect after 1555 was noteworthy, but his most important contribution to Mannerism was his championing of Mannerist ideals in his Lives of the Artists (1550). Meanwhile, the most talented painter at the court of Cosimo de Medici was Agnolo Bronzino, a pupil and quasi-adopted son of Pontormo. Right from the beginning Agnolo Bronzino had reduced the emotional content that was such an important element of Pontormo's style, and, during the 1530s established a reputation as a court portrait painter. His mature portrait art is elegant, meticulous, formal, and beautifully polished, reflecting the Spanish etiquette of the Medici court. Indeed, Bronzino soon became Eleonora's favourite painter, and was given the commission to decorate her private chapel in the Palazzo Vecchio. The resulting frescoes while not spiritually expressive, are dazzlingly stylish, with references to classical forms - an allusion to the knowledge of both artist and subject - as well as to Raphael and Michelangelo. Following the impact of the Catholic Counter-Reformation, Bronzino adopted a more modest narrative style, but retained his Mannerist essence. See also: An Allegory with Venus and Cupid (1540-50), Bronzino's mythological masterpiece. The Counter-Reformation had a similar effect on several other Mannerist painters, although only the Urbino-born Federico Barocci (1526-1612) abandoned the maniera to take up pious religious painting. Barocci's fluent and delicately coloured style, largely influenced by Correggio, may be seen, exceptionally, as a precursor of Baroque painting. Barocci abandoned his Mannerist style around 1575, but most of his contemporaries in both Florence and Rome continued to develop the eclectic aspects of the original maniera. The Siena-trained Daniele da Volterra (1509-66) and Lugano-born Pellegrino Tibaldi (1527-96) painted openly in the manner of Michelangelo, while at the end of the century Giuseppe Cesari (Cavaliere d'Arpino) (1568-1640) and Federico Zuccaro (1540-1609) explored the complex intellectual values of the Raphael studio style. Zuccaro is the best exemplar of this late phase, and his travels (to Rome, Venice, Spain, England, France, and Flanders) indicate the internationalism of the late Mannerist style. Away from Florence and Rome, artists in several Italian cities were influenced by Mannerism after 1527. The Sienese School of painting, under Domenico Beccafumi (1485-1551), developed a strange type of emotional Mannerism, and there were other variants of the maniera elsewhere. But it was only in the city of Venice that Mannerism was maintained as a consistent, independent idiom. However, even though Titian (c.1488-1576), after 1530, Paolo Veronese (1528-1588), Jacopo Bassano (1515-1592), and Jacopo Tintoretto (1518-1594), adopted Mannerist forms and ideals in some of their paintings, Venetian art as a whole continued to be dominated by non-Mannerist practices in both colorito and expression. Vasari's disparaging comments about Tintoretto's lack of good disegno clearly indicates that the differences between Romano-Florentine and Venetian painting remained fundamental. See also: Titian and Venetian Colour Painting (c.1500-76). For Mannerist altarpiece art in Venice, see: Venetian altarpieces (1500-1600), for portraits, see: Venetian Portrait Painting (c.1400-1600). For its general impact on European art, see also: Legacy of Venetian Painting (after 1600). Paolo Veronese is famous for his rich colourism and huge compositions crowded with figures: see: Wedding Feast at Cana (1562-3, Gemaldegalerie, Dresden) and Feast in the House of Levi (1573; Venice Academy Gallery). However, the richness of his colour pigments is best exemplified by works like Mars and Venus United by Love (Metropolitan Museum, New York), and Marriage of St. Catherine (Gallerie dell'Accademia di Venezia). Tintoretto himself fastened onto Titian's use of dramatic light and emotional intensity. In 1548, St Mark Freeing the Slave (1547-8, Gallerie dell'Accademia di Venezia) established him as the leading painter of the younger generation in Venice. Thereafter, a large part of his career was devoted to the completion of 66 magnificent wall and ceiling paintings, depicting scenes from both the Old and New Testaments, for the decoration of the Great School of San Rocco, Venice (1564-1588) - like The Crucifixion (1565). His crowning achievement was The Last Supper (1591-4), a huge canvas painted for the church of San Giorgio Maggiore, Venice. As befitting the most important representative of Venetian Mannerism, in this work Tintoretto made full use of receding diagonals, dramatic foreshortening, and other Mannerist methods. A comparison of this picture with Leonardo's Last Supper (1495-8, Santa Maria delle Grazie, Milan) demonstrates the differences between the High Renaissance and late 16th century Venetian painting, although the latter continued to be dominated by non-Mannerist practices in both colour and composition. The ideas of the Italian Renaissance spread throughout Europe by word of mouth, as well as via engravings and etchings. At the same time most great non-Italian painters visited Florence, Rome or Venice, to see and copy the greatest Renaissance paintings for themselves. Even so, it would be wrong to imagine that the Italian Renaissance style dominated all European painting. (Indeed, Italian Early Renaissance artists were strongly influenced by Flemish oil painting, and by specific works such as The Portinari Altarpiece (1475) by Hugo Van Der Goes.) Some Northern artists (eg. Albrecht Durer, Michael Pacher and others) adopted Renaissance painterly techniques quite confidently; others also used them but in a piecemeal manner, without a proper understanding of Italian compositional methods. After 1520, however, both Northern Renaissance artists (eg. Hans Baldung Grien) and Spanish painters (eg. El Greco) came increasingly to understand and apply Mannerist ideas in their works. For El Greco's greatest Mannerist masterpieces - a blend of Tintoretto, Parmigianino, Bassano and Michelangelo within a Byzantine frame, please see: Disrobing of Christ (1577); Burial of Count Orgaz (1588); Christ driving the Traders from the Temple (1600); Portrait of a Cardinal (1600); Felix Hortensio Paravicino (1605); and View of Toledo (1600). In fact, a number of individual schools of Mannerism began to emerge in various centres outside Italy. Mannerist paintings can be seen in most of the best art museums throughout the world, notably the Pitti Palace and the Uffizi Gallery in Florence.  For analysis of important late Renaissance pictures, see: Famous Paintings Analyzed.  For information about Italian Mannerist painting, see: Homepage.